Happiness Is a Mood Not a Destination: We've made It Half Way There!! Now it's time to relax, and meet some new bloggers! 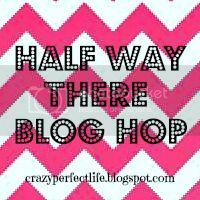 Welcome to the Third Half Way There Blog Hop! Join in! Find some new blogger, check out their post, leave some comments, and make new friends! - Grab our button, and share this awesome Blog Hop! - Don't forget to e-mail me for a chance to be a Co-Host for next week! Thanks for the Link up! I linked up, of course. thank goodness we're halfway through the week! Ican't wait for this weekend! Hello! Thanks for swinging by my blog and for following me. I'm glad to know that there are fellow bakers and cooks who love life and laughing. :) And I linked up. Because I felt like it. And I'm following you as well! Found you via blog hop, thanks for hosting I love these things! What a sweet blog...happy Wednesday!